The Broadcast Tools® Silence Sentinel® Basic is a basic stereo silence sensor designed to monitor any stereo or two independent monaural sources and generate alarms when silence is detected, but doesn’t incorporate an audio switcher. Features include: front panel, remote control and relay monitoring; plug-in euroblock screw terminals; “Plug & Play” (NO POTS) installation; dipswitch selection of the following; silence detection of -20, -25, -30 and 35dB below zero reference; precise time delay from OFF to 5 minutes in 2 or 20 second increments; restore delay timing of OFF, 5, 30 and 90 seconds and two SPDT alarm relays with LED indicators. The Silence Sentinel® Basic may be set on a desktop, mounted on a wall or optional RA-1 rack shelf for mounting up to four units in 1-RU. LOOKING FOR A CONTRACT BROADCAST ENGINEER IN YOUR AREA? HAVING TROUBLE WITH LIGHTNING DAMAGE? 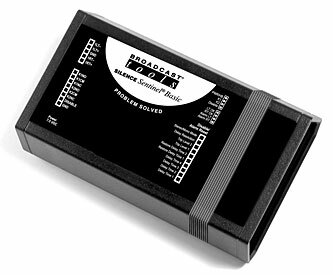 131 State Street • Sedro-Woolley, WA 98284 Ph: 360.854.9559 • support@broadcasttools.com • Fax: 866.783.1742 Broadcast Tools® is a registered trademark of Broadcast Tools, Inc. All Sentinel® products are registered trademarks of Broadcast Tools, Inc. Copyright © 1989 - 2018 by Broadcast Tools, Inc. All rights reserved. Pricing and availability are subject to change without notice.